Last January 9th was the premeire in the U.S. of the documentary “Decoding Neanderthals” produced by PBS as part of the NOVA series. This documentaries series of popular science are produced by WGBH Boston and presented by the Public Broadcasting Service (PBS) in more than 100 countries. In “Decoding Neanderthals” NOVA explores the fate of Neanderthals highlighting the discoveries made at “Sima de las Palomas” site. Over 60,000 years ago, the first modern humans—people physically identical to us today—left their African homeland and entered Europe, then a bleak and inhospitable continent in the grip of the Ice Age. But when they arrived, they were not alone: the stocky, powerfully built Neanderthals had already been living there for hundred of thousands of years. So what happened when the first modern humans encountered the Neanderthals? Did we make love or war? That question has tantalized generations of scholars and seized the popular imagination. Then, in 2010, a team led by geneticist Svante Paabo announced stunning news. Not only had they reconstructed much of the Neanderthal genome—an extraordinary technical feat that would have seemed impossible only a decade ago—but their analysis showed that “we” modern humans had interbred with Neanderthals, leaving a small but consistent signature of Neanderthal genes behind in everyone outside Africa today. 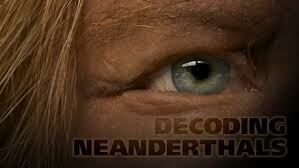 In “Decoding Neanderthals,” NOVA explores the implications of this exciting discovery. In the traditional view, Neanderthals differed from “us” in behavior and capabilities as well as anatomy. But were they really mentally inferior, as inexpressive and clumsy as the cartoon caveman they inspired? NOVA explores a range of intriguing new evidence for Neanderthal self-expression and language, all pointing to the fact that we may have seriously underestimated our mysterious, long-vanished human cousins.